ASUS has just added to its Intel 200-series motherboard lineup with the announcement of two new mini-ITX motherboards. 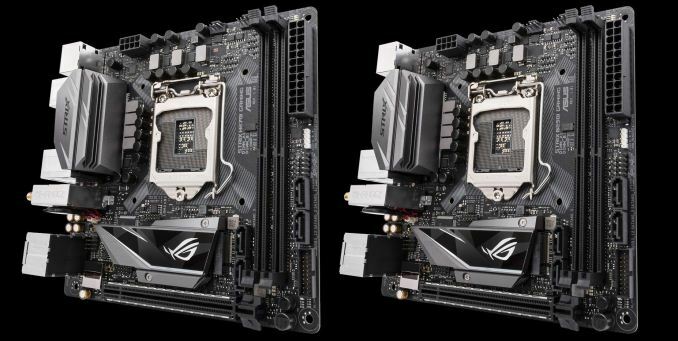 Dubbed the ROG Strix H270I Gaming and ROG Strix B250I Gaming, these two models differ when it comes to chipsets, but they are otherwise functionally identical in most respects. Up until now, the ROG Strix Z270I was the only 'high-end' mini-ITX model in the ASUS LGA1151 product line, and given the absence of a Maximus IX Impact it has served as the spiritual successor to the Maximus VIII Impact that we reviewed back in December 2015. 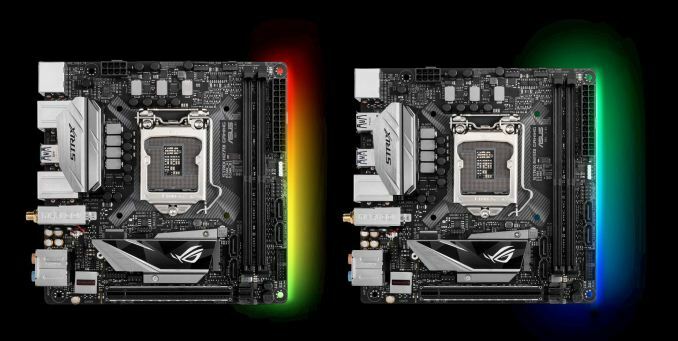 The lineage between the ROG Strix Z270I and these two latest models is much more obvious. Aside from one less MOSFET heatsink, the chipset, and some different VRM components, all three of these motherboards are all largely indistinguishable. Having said that, whereas the higher-end Z270-based model supports both CPU and memory overclocking, these two new more affordable models are aimed at those running stock-clocked CPUs. As such, they are also limited to memory speeds of DDR4-2400. While we are on the subject of memory, both motherboards clearly only have two memory slots and therefore system memory is limited to 32GB. 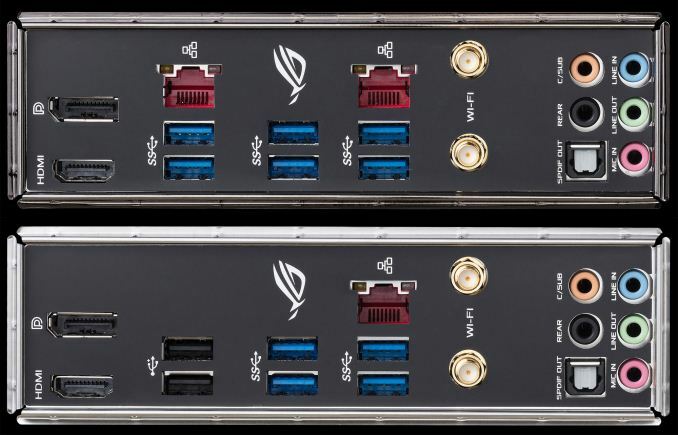 An interesting part of these mini-ITX models is that ASUS have managed to fit two M.2 connectors on a tiny PCB footprint. This is due to a double-decker heatsink design that allows an M.2 drive to be stacked on top of the PCH heatsink. This means that the M.2 drive is also cooled by the top cover of the heatsink. Both M.2 connectors can handle full-speed PCIe 3.0 x4 NVMe SSDs, as well as Intel Optane Memory, but only one of them supports SATA-based M.2 solid state drives. Both motherboards have four SATA 6Gb/s ports and support Intel Rapid Storage Technology, although only the Strix H270I has RAID 0, 1, 5, 10 and Intel SRT capabilities. There is a small divergence when it comes to USB connectivity, with the H270I supporting eight USB 3.0 ports (six rear, one header) and the B250I supporting six USB 3.0 ports (four rear, one header) and two USB 2.0 ports (two rear). The H270-based model also has two gigabit LAN ports (one powered by an Intel I219V and the other a Realtek RTL8111H) while the B250-based model only has a single gigabit LAN port courtesy of an Intel I219V controller. All of these LAN ports are protected by LANGuard surge protectors and can be managed using the ASUS GameFirst IV traffic management software. Both models also have onboard dual-band 802.11ac Wi-Fi with MU-MIMO, Bluetooth 4.1, and an included 2x2 external antenna. For those planning to use integrated graphics, both motherboards feature HDMI 1.4 and DisplayPort 1.2 video outputs. Given the obvious size constraints, the Strix H270I and Strix B250I only have one PCIe 3.0 x16 slot, and it is SafeSlot metal-reinforced (additional PCIe rigidity for heavy GPUs). Onboard audio duties are handled by an ROG SupremeFX eight-channel HD audio solution, which is based on the Realtek ALC1220A codec. There are dual headphone amplifiers, which means additional power and impedance sensing for both the front and rear headphone outputs. This onboard audio implementation also benefits from the ASUS audio software suite that consists of Sonic Studio III and Sonic Radar III. Since it is apparently the must-have feature of the second half of the decade, ASUS has added AURA RGB lighting to both of these models, in the form of a series of LEDs placed along the entire right side. There is also one RGB header that can power an LED light strip. Due to the Aura Sync feature, all of the lighting is controllable from within the AURA utility. While we are on the topic of cool features (Ed: Punny...), there are three total fan headers - one which can handle a water pump or high amperage fan - and all of which can be managed by the excellent Fan Xpert 4 UEFI and/or software fan controls. There's no word on availability or pricing, other than the fact that we expect the Strix H270I will cost a little bit more than the Strix B250I.